Reference number for this case: 2-oct-54-Espartignac. Thank you for including this reference number in any correspondence with me regarding this case. In Espartignac in Corrèze, on October 2, 1954, at 01:30 P.M., a very shiny cylinder has been seen raising vertically. French ufologist and author Jean Sider learned in an article from the newspaper "Le Courrier - La Liberté", of Limoges, on page 1 for October 8, 1954, that a young girl aged 8 who was on her path to the school on October 2, 1954at 01:30 p.m. in Espartignac was frightened by a strange phenomenon. She at once called her mother who then saw a cylindrical object, extremely brilliant, which appeared to rotate at a very important speed and which went up in the sky where it disappeared. The website indicates that on 2 October 1954 at 13:30 in Espartignac, France, there was a UFO sighting. 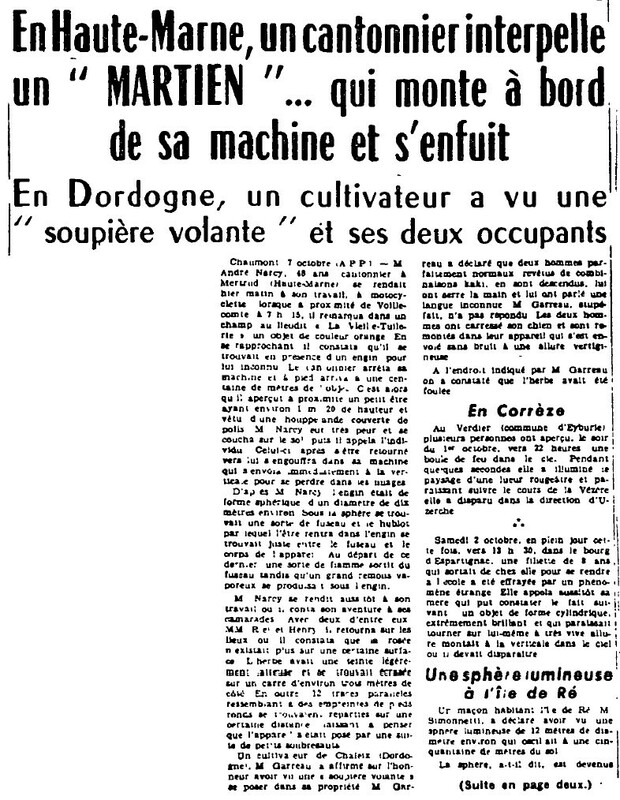 [---] Article in the regional newspaper Le Courrier - La Liberté, Limoges, France, page 1, October 8, 1954. [ld1] Ufology magazine Lumières Dans La Nuit (LDLN), France, #319, page 4, July 1993. [js1] "Le Dossier 1954 et l'Imposture Rationaliste", book by Jean Sider, Ramuel publisher, France, page 92, 1997. 1.1 Patrick Gross December 24, 2016 Additions [pc1].